B&Bs or Guesthouses offer a great, often cheaper, holiday accommodation than hotels. They are generally smaller establishments and can provide more of a personal touch than large hotel chains. You can choose from 16 Bed and Breakfasts in Gloucestershire. If you know the town within Gloucestershire you want then the menu on the right will filter the results. The Abbey - This quality B&B hotel in central Cheltenham is located beside the pretty Sandford Park, amid a conservation area. It is well run by friendly, unstuffy owners and has free Wi-Fi. Abbey Hotel is a short walk from Cheltenham's shops, restaurants, theatres and bars. Free parking permits are provided for your convenience. For solo travellers not wishing to dine out, light snacks are available from the residents' bar. Malt House - This family-run hotel and restaurant in the heart of the Cotswold Hills is close to Berkeley Castle, the Jenner Museum, the Wet Lands Trust and Slimbridge Severn Way. Boasting a warm and welcoming atmosphere, The Malt House is an informal, friendly inn where you can relax with a good meal and drinks. Many attractions are nearby, and you can use the hotel as a cosy base for exploring Berkeley Vale and Gloucestershire's countryside. The Jessop Townhouse - Bed & Breakfast - In the heart of Tewkesbury, close to Tewkesbury Abbey, this Grade II listed Georgian building has a private car park for 4 cars, a private courtyard and king-size/super-king-size beds. 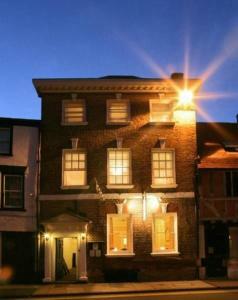 The Jessop Townhouse (formerly Jessop House Hotel) is privately run and offers a very high level of hospitality. Retaining most of its original features, here you can enjoy a town centre location. Sample the licensed bar and enjoy Freeview in all rooms. Wireless internet access is also available. Each morning you can purchase breakfast from a wonderful breakfast menu with a wide selection. Lypiatt House - Lypiatt House is a 5-star Guest Accommodation in the most fashionable area of Cheltenham. Expect Victorian style suitably mixed with modern decor. The breakfast is popular! The house has free parking and is within walking distance of many superb restaurants. The main shopping area and theatres are also close by. Lypiatt House is ideal for visiting the the Cotswolds and The Forest of Dean. Volunteer Inn - This locally owned 17th century inn, is crammed with history, traditional local cask ales and plenty of character, and stands at the lower end of Chipping Campden's historic High Street. The inn is set in the small Cotswold town of Chipping Campden, an area renowned for its natural beauty. It has a peaceful position within a few hundred yards of the town centre. It is located at the start of the Cotswold Way - a well known walk along the Cotswold Hill to Bath The inn was named The Volunteer in the mid 1800's because local men used to 'sign on' there for the volunteer armies. The staff aim to supply you with a quaint, comfortable room in a homely atmosphere, as well as forwarding local knowledge on the best places to visit. Rooms are serviced on request. Beaumont House - This 5-star guest house built in 1850 has a beautiful garden, lovely rooms and free parking. It is walking distance from Cheltenham town centre and fashionable Montpellier. Local shops and excellent restaurants are a 5-minute walk away. Bedrooms are beautifully designed and have free Wi-Fi access and flat-screen TVs with satellite channels. An evening meal room service is available from Monday to Thursday until 20:00. At Beaumont House, service is friendly and efficient, and there is a lounge with a Trust Bar and comfortable Conservatory with free cappuccinos, biscuits and beverages. Award-winning cooked breakfasts are served daily. Beaumont House has 5 stars from the AA and a Highly Commended award, in addition to the 5 stars and Gold Award from Enjoy England. The Good Hotel Guide, Sawday's and Johansens have included Beaumont in their 2011 guides. The Wyastone - Centrally located in a quiet, tree-lined avenue in Montpellier, The 5-star Wyastone offers free Wi-Fi, free parking and Silver award-winning guest accommodation. The promenade is just a 10-minute walk away. The Wyastone is less than 5 minutes' walk from stylish shops, boutiques and restaurants in Cheltenham. The spacious en suite rooms have luxurious features including 32-inch flat-screen TVs and super-king-size beds. An elegant four-poster room is available. There is a quiet, leafy courtyard garden and a lounge with a cosy fireplace. Guests also have use of the gym and swimming pool at Cheltenham Ladies College, just a short walk away. Royal Lodge - The hotel is nestled just below Symonds Yat Rock and stands exclusively in grounds of almost 5 acres, overlooking the river. It has terraced gardens of magnolia trees and a well established wisteria. The Royal was originally built in 1876 as a royal hunting lodge, and was converted to a hotel in the 1920s. The Royal Oak Inn, Tetbury - The Royal Oak Inn is situated in the beautiful Cotswold town of Tetbury, in the heart of Gloucestershire. It is a 300-year-old English pub, serving real ales and home-cooked food. The Royal Oak provides 6 well-appointed rooms in a separate bed and breakfast suite. Free private parking is available on site. 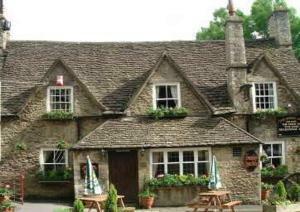 Set between Bath and Cheltenham, the Royal Oak is an ideal base from which to explore the Cotswolds. Westonbirt Arboretum, Gatcombe Park and Badminton are all within a 15-minute drive. Swindon is 25 miles from The Royal Oak Inn. The city of bristol is 30 miles away. Cleeve Hill House - Set upon the highest point in the Cotswolds, this elegant 5-star guest house features spacious, individually decorated rooms with plasma TVs. Guests can enjoy excellent views over the Malvern Hills. All of the bright, warmly furnished rooms at Cleeve Hill House feature both private en suite bathrooms and free Wi-Fi. Guests can also make use of free Wi-Fi and tea/coffee facilities. Guests can also make use of the house's laptop on request. Breakfast is served in the beautifully decorated glass conservatory with stunning views of the local countryside. Guests can enjoy fresh full English breakfasts as well as fresh fruit, juice, and yoghurts. A bar and relaxing lounge area is also available to guests. Free parking is available, and the historic Sudeley Castle is a 5-minute drive away. Cheltenham and its famous racecourse is 10 minutes away by car, and numerous scenic walks can be enjoyed in the surrounding hills.